The debate on carbon has focused agriculture’s thoughts back on the level of carbon in soil and raises questions about how soils can be better managed to store more carbon. Most soil carbon in a soil is stored in the organic matter, so the higher the organic matter in a soil the higher the carbon. More carbon and organic matter in a soil means improved fertility and better water-holding capacity. Up until now, this has been a part of the soil carbon/fertility story that has been given little prominence. Biological soil crusts are now being better recognised as important structures that contribute to soil fertility and protect the soil surface from erosion and evaporation. These soil crusts have been called by various names over the years, such as cryptograms or microbiotic or microphytic soil crusts. Biological soil crusts seem to be the phrase most favoured at the current time. 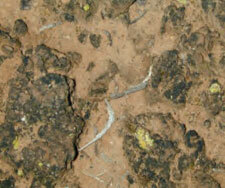 These biological soil crusts are seen on some soils in south-east Queensland and appear as a dark slimy substance when wet, changing to a thin cracking film when dry. The colours of soil crusts will vary depending on the dominant organism in the crust. Biological crusts on soil surface (Source: US Geographical Survey). The biological crusts consist of lichens, bryophytes, algae, microfungi, cyanobacteria and bacteria growing on or up to 4mm below the soil surface. These biological crusts are found globally in arid and semiarid environments and are common in Australia. The cyanobacteria, a component of these soil crusts, are photosynthetic. Research carried out on cyanobacteria in Queensland’s gulf country indicates how important they may be for fixing and storing soil carbon. It has been proposed that 25% of the earth’s carbon may be held by cyanobacteria in soil crusts and rock biofilms. Research overseas has shown that cyanobacteria can fix between 0.02kg/ha/yr of nitrogen to as high as 100kg/ha/yr during optimal moisture and temperature conditions. At the higher level, the contribution of the cyanobacteria is the same as applying 10 x 20kg bags of urea to one hectare of pasture. In addition some research is indicating that these biological organisms can secrete compounds that increase the bio-availability of phosphorus which, apart from nitrogen, can be one of our most limiting soil nutrients. Biological soil crusts have an important and integral role to play in ensuring our soil biology is working. Research work in western New South Wales has shown that the crusts are susceptible to damage by continuous heavy stocking. A study at Cobar found that once the soil crust was damaged and broken up by heavy stocking rates, nutrient leaching in the sandy soils increased and soil moisture was lost. This contributed to a rundown in the productivity of the pasture. It is worth keeping an eye out for these biological crusts on your soil surface. They might look insignificant but they could be playing a key role in keeping your soils productive and ecosystems in working order. For more information please contact Damien O’Sullivan, DAF Kingaroy.